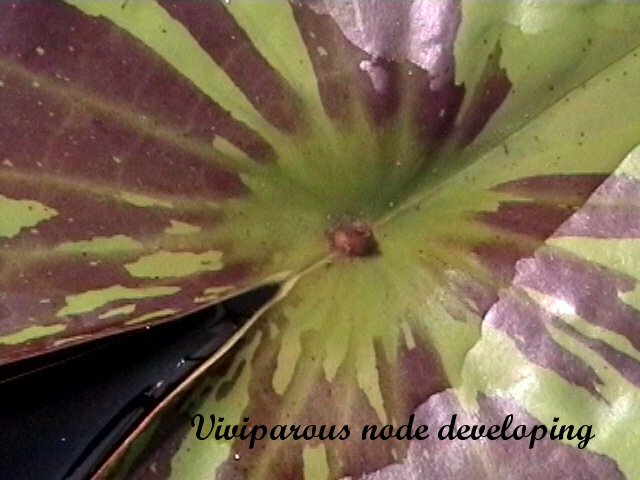 Description: Some tropicals are viviparous--meaning a new plant will develop on a mature leaf where the stem joins it. The first indication of this is a fuzzy-like growth on top of the leaf joint. As the leaf matures, the fuzzy will start to produce very tiny leaves and roots of a new lily. Eventually the leaf & stem will completely decay, leaving the tiny plant to free float in the pond. At this point, I recommend removing the "plantlet" to a bucket filled with pond water so the plantlet doesn't get lost or munched on by a fish. Keep the bucket in a partially shaded area. At this point, some people will add liquid fertilizer to the water. I personally haven't done this. When the plantlet is the size of a half dollar, I will carefully plant it in a small pot. Place in water with about 2-3" of water over the pot, partially shaded. When leaves start to reach to surface, lower and place in full sunlight. I have had some plantlets mature to blooming size within 40 days! Not all viviparous starts will survive, but it is fun to grow the lilies this way.